Your hardwood floor is beautiful. Here's how to keep it that way. The best and easiest thing you can do to protect your floor is to use walk off mats at every entrance to your home. That literally stops dirt at the door. Keep in mind to use the proper mats that won’t scratch, stick or gum up the floor. If you have hardwood in the kitchen, definitely get a good mat to place in front of the sink. One of the greatest threats to your floor comes from heavy furniture that can easily scratch, dent and create further damage. Make sure all heavy furniture has felt protectors. Next is regular sweeping (or Swiffering) to keep what dirt does make it inside from damaging the floor and dulling the shine. You may occasionally have to vacuum to get at dirt between boards and at the edges of the room. Set your vacuum so as not to use the beater bar. Regular damp mopping is not recommended for hardwood flooring but feel free to use a damp washcloth to wipe up any spills, stains or scuffs. Hardwood floors will fade in direct sunlight, especially after years of exposure. Two things you can do: Use shades and window treatments in high sunlight areas; also, if you use area rugs, move them around regularly so that the whole floor adapts to sunlight exposure, not just the spots that are left uncovered. 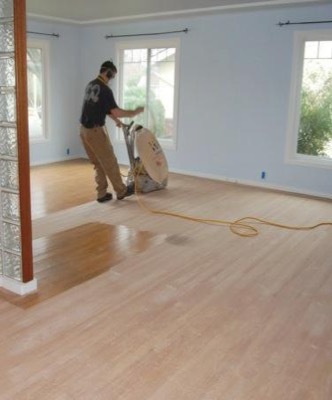 Stay away from waxing most prefinished floors that have urethane wear layers. Wax will only dull the shine and could also damage the finish. Professional cleaning is sometimes required and is a good part of any floor care routine. Do I look fat in these heels? 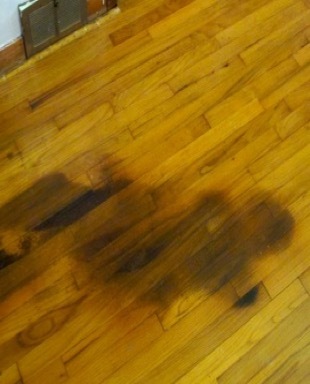 A woman’s high heels are one of the least expected but major culprits of wood floor damage. A 125-pound woman in high heels exerts more pounds per square inch of pressure on a floor than an elephant, according to the National Wood Flooring Association. 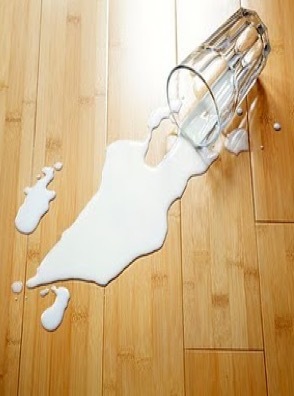 Even though many floors feature protection against spills, most won’t protect you against a spill that sits too long. That is especially true for pet accidents which can leave deep stains in wood. It's true, we're seeing pet protection against pet spills and accidents for all flooring types, including hardwood. But your floors can still scratch and stain if not properly protected. Go ahead, trim the dog’s nails and no playing fetch on your hardwood floors (sorry Fido). 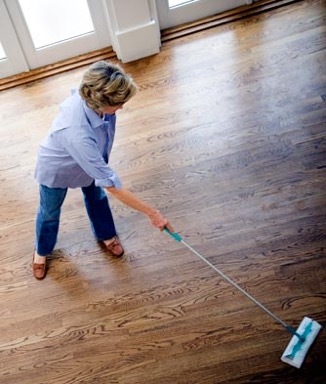 Most manufactures have recommended cleaners that you can purchase at a flooring store. Of course, you can’t go wrong using a manufacturer’s recommended product, but there are plenty of choices at your local supermarket that are up to the task. But always avoid harsh chemicals and cleaning agents. 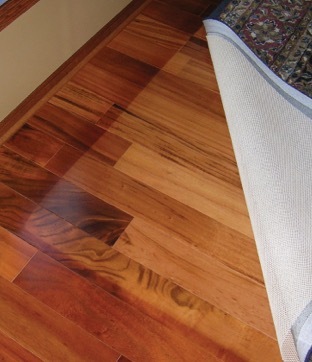 One of the great things about hardwood flooring is that if damaged or dull, it can be refinished. More than once. When dullness sets in, a simple screen and recoat may be in order. For deeper wear and damage, a complete sand and refinish may be recommended. You can also repair a wood floor but it can get complicated. Believe it or not, the repair is the easy part - for a trained professional, that is. The difficult part is matching the replacement plank to the existing floor. It helps if you have some left over pieces from the original install.